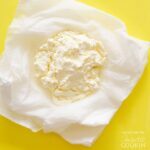 Did you know you can make your own ricotta cheese at home without all the hassle of a thermometer and cheesecloth? You just need a microwave, some milk, lemon, and salt to make this 5 Minute Homemade Ricotta! In a microwave safe bowl, stir to combine milk, lemon juice or vinegar, and salt. Set two layers of paper towels in a wire mesh sieve, and set over a large bowl. Gently pour the milk mixture into the sieve to strain out the liquid. You can let your ricotta strain up to 1 hour. The longer it sits, the firmer your ricotta will be, though I like it fresh and warm. This recipe for 5 Minute Homemade Ricotta was printed from AmandasCookin.com - https://amandascookin.com/5-minute-homemade-ricotta/ and can only be printed for education or personal use.